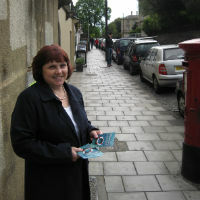 We at Buckingham Chapel are keen to share the good news of the Christian message with everyone in our locality. A warm welcome is therefore given to all who would wish to join us at any of our meetings! In addition to this, however, we have small group of individuals who specifically focus on reaching out to our community. This is done in a number of different ways. You may see some of us standing outside the church on Sunday evenings, giving out Christian literature. Or perhaps you may receive a church magazine through your letterbox every six months or so, or receive a visit from a couple of members of our visitation team. You may think initially that we represent the Jehovah’s Witnesses movement, but please do not be mistaken! Instead, we would love to talk to you and try to answer any questions you may have in relation to Christianity. If you would like to receive a visit, please contact Pastor Oliver Gross on 0117 3368711.